The motivation behind a dog’s aggressive reactivity needs to be carefully considered if one suspects pain to be the impetus behind a dog bite attack.Certain behavioral criteria should be used to make a differential diagnosis. Information about the following is usually relevant: (a) The context in which the incident happened; (b) The behavioral history of the dog; (c) Medical condition of the dog prior to and at the time of the incident; (d) The behavior of the plaintiff prior to and immediately preceding the attack; (e) The dog’s reaction to the plaintiff’s behavior. The above information needs to be gathered and analyzed collectively to make the proper diagnosis of pain elicited aggression. Some aspects may be relatively more significant than others, however. For example, when a dog experiences pain, vocalization may happen and then attack the most immediately thereafter. Vocalization may not happen. However If the dog vocalizes, usually it’s a high pitched sound, but a dog may only growl and then immediately bite if it anticipates similar interaction that earlier caused pain. 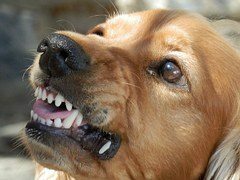 Generally, a dog’s aggressive reaction elicited by pain has a greater chance of occurring when several variables come into play simultaneously. In sum, it is important to ascertain the dog’s history, relevant contextual variables at the time of the incident, and how the dog was behaving immediately before the painful stimulus was applied. In a addition, a rating system based on a descriptive account of the dog’s observable behavior can be used. At one extreme, without pain, a dog has a relaxed demeanor, the gait is normal and the dog shows no discomfort when handled. A dog experiencing various degrees of pain may display a tense demeanor, often accompanied by shivering, and little or no body movement. A dog in severe pain frequently will not stand or walk. Breathing may be labored. Somewhere between these extremes is the dog experiencing mild pain, and when this happens, the dog may limp, general movement becomes restricted, and the dog may assume a quiet attitude. Dogs in moderate to severe pain may appear depressed and often show little interest in their surroundings. Such behavior is understandable because dogs usually behave in ways to minimize pain. In sum, The animal behavior expert can differentially diagnose pain elicited aggression from other kinds of canine aggression to determine if pain was the impetus causing the dog to bite.